This garden was another collaboration with Pittsburgh History & Landmarks Foundation [PHLF]. It was planted August of 2002. It is also a perennial garden, which was planted by a landscaper. We are glad to see the weed and poison ivy patch gone and this fledgling garden in its place. Walkers on the StepTrek are treated to walking past both of these gardens on the ‘Gold Trek’ route. This garden was our first collaboration with Pittsburgh History & Landmarks Foundation [PH&LF]. At the base of the 18th Street steps, which lead up to Pius Street, this garden was planted with historic accuracy based on research by PHLF. This perennial garden has beautiful yellow roses, yucca and ferns cover the hillside. A grotto can be seen in the far right corner of the garden hillside. Water trickles down in the summer and icicles form in the winter. This bend is one of the many gateways to the Slopes. The garden was conceived and planted in the summer of 2000. PHLF created the design plan and purchased the plants. The garden was then planted by a landscaper and mulched by volunteers from the SSSNA. Neighbors from the Slopes and SSSNA members volunteer and tend the garden. The following is an excerpt of an article written by Dennis Berry in the SSSNA Newsletter, Slopes News, of June 2000. “And just a couple of blocks West is the curve of 18th Street, near the junction with Josephine Street is the location of the most unique, newest garden to be planted and tended by the SSSNA Beautification Committee. This garden will be funded by the Neighborhood Assistance Program/Comprehensive Service Program (NAP/CSP). 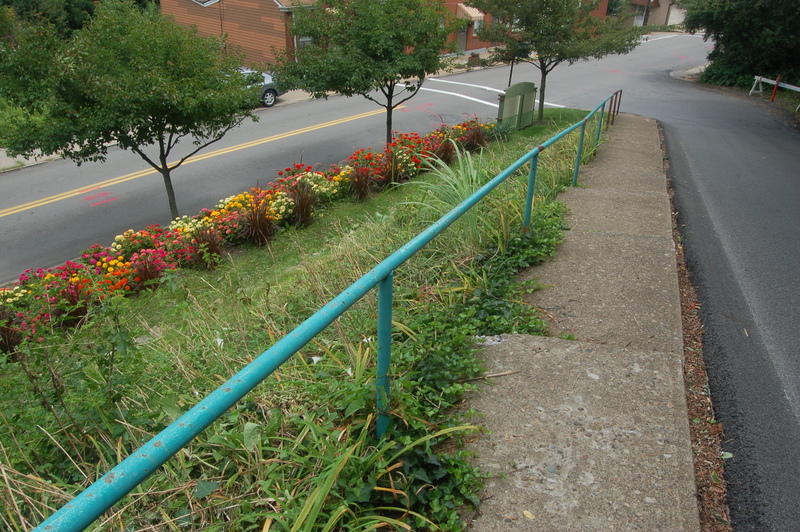 The site was surveyed and identified by Greg Yochum, a horticulturist with Pittsburgh History & Landmarks Foundation, with the help and cooperation of the SSSNA Beautification Committee. The unique aspect of this garden is that it will entirely be made up of plants & flowers of a historical nature, that were commonly popular at the turn of the 20th century. The garden was designed by Barry Hannigan, who is the Director of Landscape Preservation at PHLF. It is his intent to present a garden common to the homes of this area during its hey day. The idea is for this public garden is to give the appearance of a turn of the century house garden, minus the house. This garden, created May 22, 1999, was also from collaboration with Western Pennsylvania Conservancy. The plant materials are funded by the sponsors: Green Neighborhood Initiative, The Birmingham Foundation, Columbia Gas of Pennsylvania and given to the Conservancy. The Conservancy gives us the perennials to plant each spring. They also provided the day lilies that line the back of the garden and return thicker every year. Each spring SSSNA & Slopes neighbors volunteer to plant and tend the garden. We are grateful to our neighbors that cut the grass all summer. In time we would like to make this garden more perennial. We even have some plans for the landscaping. This Garden was planted May 22, 1999. Our Master Gardener, Mike Janesko, petitioned the Western Pennsylvania Conservancy for this garden. It replaced a dumpsite for discarded trash. The Sponsors for this garden are Green Neighborhood Initiative, The Birmingham Foundation, Columbia Gas of Pennsylvania and the South Side Slopes Neighborhood Association. Today, it is well-established garden area where annuals are lovingly planted every spring. Slopes residents and SSSNA members turn out every year to plant and later weed. In 2002 it was full of petunias and the ornamental grasses that were planted over the years are thriving. 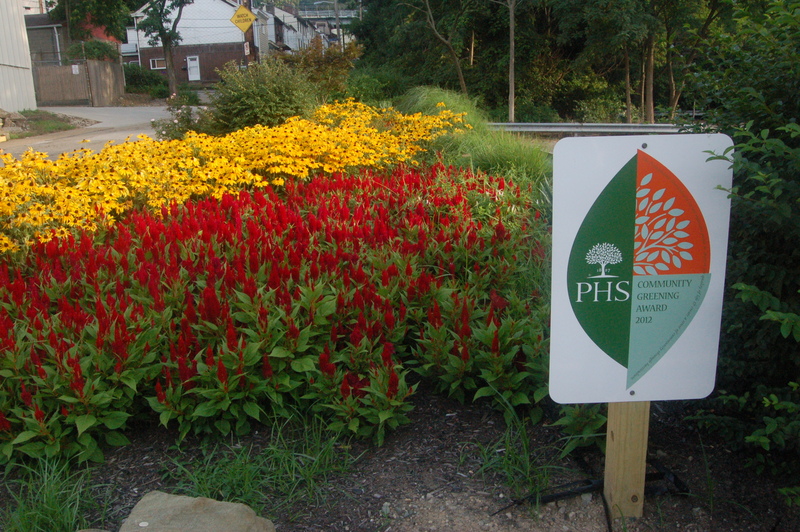 In 2012, the garden received the PHS Community Greening Award. 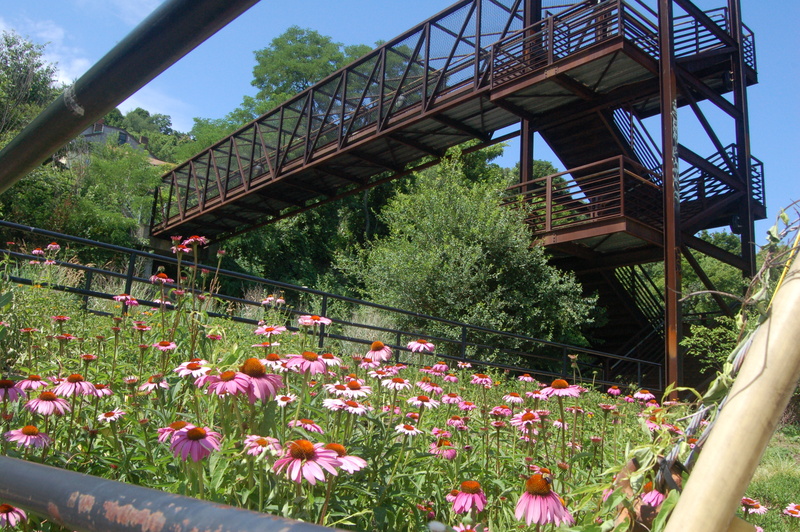 This native drought-resistant perennial flower garden was developed with volunteers and funding from Deloitte IMPACT Day, Slopes neighbors, and the South Side Local Development Company, along with design by LaQuattra Bonci Associates in the summer of 2010.